A beta testing version of the new Sanitary Facilities (SF) calculator has been released for feedback on its functionality and performance. 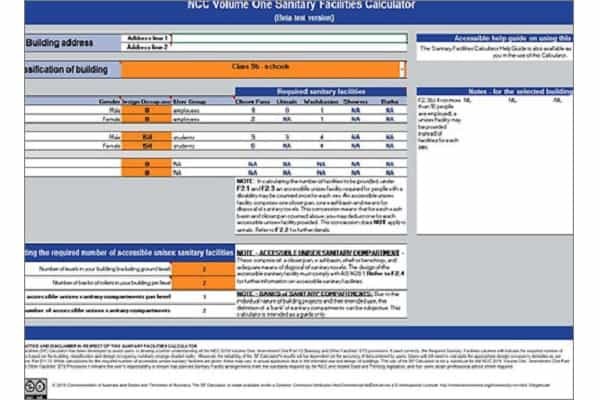 This easy-to-use calculator has been designed to assist user understanding and application of the Sanitary and Other Facilities Deemed-to-Satisfy Provisions in NCC Volume One. To use the calculator, simply select the building classification and enter the number of occupants the building has been designed for. This results in the required number of sanitary facilities for that building, including (where applicable) closet pans, wash basins, urinals, showers and baths. By entering the number of building levels and banks of toilets, the calculator will also calculate the required number of accessible unisex sanitary facilities. Interested users can access the beta testing version of the SF Calculator now. Feedback is open on the calculator and its performance until Sunday 14 October 2018.